We went in search of the most cost effective way to wash a large area with UV light for all those DJs out there wanting to take their glow parties to the next level. Having tried many of the first generation LED "UV" lights we were impressed, but knew that the idea of a low power LED UV light could be taken to the next level. Aug 31, 2014 We are not sure where CHAUVET was planning on going with the idea of a rechargeable, battery powered line of lasers, but after working with the EZMin Laser series, we can now see why. Jul 29, 2014 Adjectives such as rich, smooth, and silky are usually directed at foods until we were able to play with what the CHAUVET has brought in the SlimPAR Hex 3. The colors produced by this light can only be described with words like that. Nov 28, 2013 On the bench today we have the American DJ Event Pod. This light is a little unusual as in it kind of falls into the decorator family of lighting, but we will run through it for you. Sep 30, 2013 Just in time for the Halloween season, ADJ sent us over some LED UV Go lights to review. 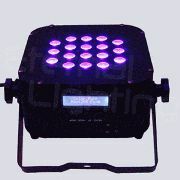 Aug 28, 2013 CHAUVET LFS-75DMX is a lightweight gobo powerhouse. Why do we say this? Jul 31, 2013 On the bench today we have the American Dj Quad Phase Go, one of the latest in a series of battery powered DJ lighting geared towards events where you either are short on AC power, or just want a quick cordless setup at an event.